Chalet "Arche", 2 storeys, built in 1976. 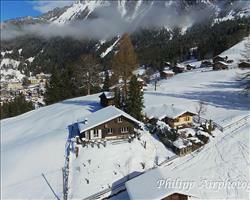 1 km from the centre of Wengen, in a quiet, sunny position. In the house: central heating system. Pre-arrival grocery service. Stepped path (60 steps) to the house. Shop 1 km, supermarket 1 km, restaurant 1 km, bar 1 km, bakery 1 km, 15 minute walk to the centre, railway station 1 km. Cable car 1 km. Please note: car-free holiday complex. Arrival via mountain railway. 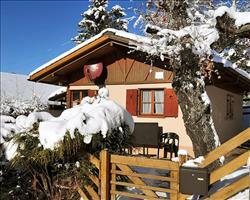 Arrival is only possible by train from Lauterbrunnen – 14 minutes driving time. 6-room chalet. Spacious, partly with sloping ceilings, rustic and cosy furnishings: 1 room with 1 double bed (1 x 160 cm, length 200 cm), bath/shower/WC. Kitchen-/living room (oven, dishwasher, electric coffee machine, Capsules for coffee machine (Nespresso) extra, fondue Set (cheese)). Upper floor: large dining room with cable TV, radio, CD-player and DVD. 1 room with 1 double bed (180 cm, length 200 cm). 1 room with 4 beds (90 cm, length 200 cm). 2 Baths/showers/WC. 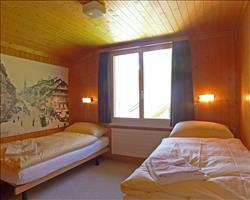 Top floor: 1 room with sloping ceilings with 1 double bed (160 cm, length 200 cm). Balcony, terrace. Terrace furniture. Marvellous panoramic view of the mountains. Facilities: washing machine, iron, hair dryer. Internet (WiFi, free). Please note: non-smokers only. We update Arche's details often, but facilities do change. e.g. some extras listed by the supplier as "free" or included might only be for the first time you use them, or for one time per party, then charged for further use. If any specific feature is essential to your holiday, make sure you ask us to confirm the details of it before you book your holiday. 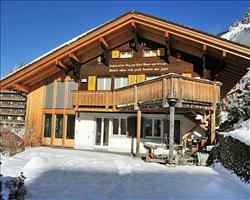 This accommodation only holiday to Arche in Wengen, Switzerland departs Saturday 27th April 2019, for a 7 night stay on a "self catering" board basis. A local tourist tax (Taxe de Sejour or Kurtaxe) is levied by many councils in European ski resorts. It varies by standard and type of accommodation and is age dependent, so not everyone is charged. It's not included in the basic price of your holiday and is usually paid locally. For reference, the average charged in winter 15/16 was between 50p and £2 per person, per night. Wengen lift pass price last reported as CHF 323.00 (adult 6 day). Ask for a quote when booking Arche. Wengen has NSEW facing slopes. Zwärgli Wengen Switzerland, Without Flights to Without Flights 27th April. Star Wengen Switzerland, Without Flights to Without Flights 27th April. 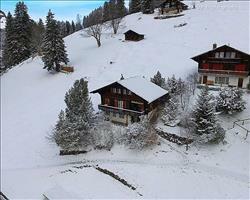 Mioche Wengen Switzerland, Without Flights to Without Flights 27th April. Steingärtli Wengen Switzerland, Without Flights to Without Flights 27th April. Jungfrau an der Ledi Wengen Switzerland, Without Flights to Without Flights 27th April.